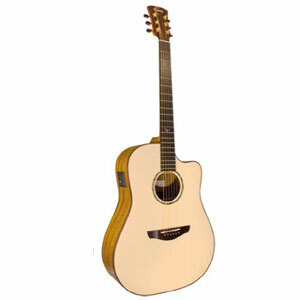 The Faith Guitars® Trembesi series are an exciting departure from traditional mahogany or rosewood. Rich, mellow yet remarkably strident, the Faith Trembesi series are an exciting departure from traditional mahogany or rosewood. Still equipped with the essential lacquered Solid Spruce top, the satin finished, Solid Indonesian Trembesi back and sides not only look beautiful but also produce a surprisingly punchy tone. The Faith Trembesi series offer a visual appeal closer to understated mahogany, yet with the aural punch of rosewood. Faith Trembesi series guitars are bound with Solid Rosewood and feature Macassan Ebony fingerboards, headplates, heelplates, bridges and bridge pins. Electro models feature the Shadow NanoFlex II undersaddle pickup and Shadow SH863 preamp system. All Faith Guitars are complete with a Faith Hardcase.